Posted on Thu, Feb 9, 2012 : 5:10 a.m.
On Friday, Jan. 20 Regus opened its first office center in Ann Arbor. Mayor John Hieftje attended the grand opening and participated in a ribbon-cutting ceremony to mark the opening of the Ann Arbor center. Pictured with Mayor Hieftje (center) is Sara Baer, Ann Arbor team leader, and Customer Service Representative Kelsey Fink. 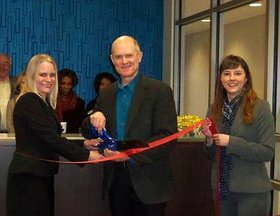 Regus, a global flexible workplace provider, opened a new full service center in South State Commons at 2723 S. State St. The center features fully-equipped and virtual offices meeting rooms, videoconferencing and an administrative staff. Regus’ global operations and scalability allows companies to enter new markets and expand without being locked into long-term fixed leases. Regus was founded in Brussels, Belgium in 1989 and is headquartered in Luxembourg.